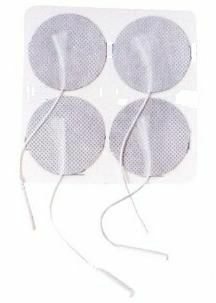 TENS Pros Premium® TENS Stim Electrodes 3.0" Round, White Cloth, Carbon Layered, TENS Pros Gel, Reusable electrodes. Call us for Private Labeling information. We can private label these electrodes for your clinic at no extra cost. Minimum purchase required for private labeling is 50 packs. Buy a case of 400 packs and save extra money today!!! My wife loves these and the 2x3.5 inch rectangles as well. These seem of great quality, and we've never found the adhesion to drop. The price makes it easy to dispose of a 4 pack every 2 months. Plus, you have no regrets if you ever pull the wires out of the pad! Love this product and the large size of the pads. Delivery was extremely quick. I am very pleased with the product and the vendor. I will order again as needed. Great products! Reliable! Fits with any unit! Great Company! A+++! Great customer service and the electrodes work great. I like the bigger size, but 1 drawback is like your hands they are a bit big. Over all I like them and they work great, and stick great. I have always used the square ones but the circle ones are amazing! The shape fits so comfortable and is easy to apply, it also covers more. Product is great and ships fast! Love the three inch round. Great coverage. I like these electrodes. They spread the sensation over a larger area and don't leave red spots even when I leave them on for long perids of time. Thry also can be removed and replaced many times . Very pleased with the purchase. Being that they are round, they are easier to place and do no have corners that will catch on clothing that has to be pulled over the head. They seem to be tackier than the squares. When they have to be replaced, will purchase the same item. Can not beat the price or quality. They are better than the original ones I purchased which cost $26.00 at the time. I love them. I use a TENS Unit for back pain. This item is just the right size and perfect with my TENS for pain relief. I would definitely reorder from this vendor. Easy to order and fast delivery! Thank you. The quality and size are good. Only draw back is the adhesive is a little TOO sticky. Have a hard time peeling them off the plastic and my body. If I don't place it on just the right spot, I have to fight to peel it off and replace it. Leaves a little bit of stickiness on my fingers as well. Otherwise it's great. The 3" round premium electrodes arrived quickly. The quality is very good and they fit perfectly with my old l997 tens unit. I didn't think I would be able to find electrodes to fit. There was a good variety to choose from for my unit. Thanks again. Excellent quality. I was totally happy with the product. Excellent. Arrived in a timely manner. I have three fractured vertebras in my back and scoliosis these pads make using the tens a breeze. I love them and will be ordering more in the future. I am a Hospice nurse and I work on my feet 7 days a weeks. and I can also use my tens at work. I have also recommended it for several clients .Once again thank you so much for the fast and supreme services. High quality product that hold its adhesion power after multiple users. These electrodes worked perfectly, and the price was the best I found when I was searching for replacements. Q: Are these compatible with the Empi Select device? Yes. All of our electrodes are compatible with EMPI devices, but our lead wires are not. Q: Are these self adhesive? Yes. All of our electrodes are self-adhesive, meaning they already come with the adhesive gel already on them, unless otherwise stated. Q: Will these pads work with my IGIA Electro Sage 8 unit? 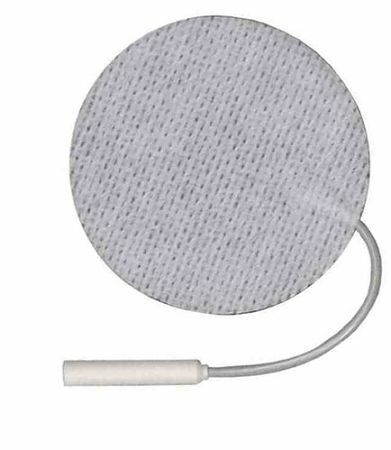 Our electrodes, including these 3" Round White Cloths, may be used with the IGIA ElectroSage 8 device, however, our lead wires are NOT compatible.